Gucci has brought out the big guns with their newest collection and show; Alessandro Michele, otherwise known as the renaissance man, showcased a trippy yet dazzling cruise collection – and a memorable one at that. 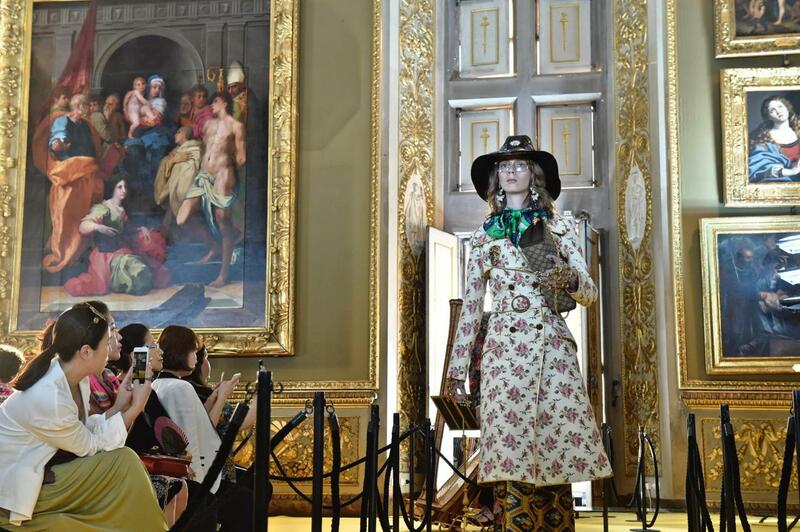 The Italian powerhouse took to familiar grounds to unveil its Cruise 2018 extravaganza, at Florence’s Palazzo Pitti. The show space inside the Palatine Gallery of Palazzo Pitti, first opened to the public in 1833, the gallery exhibits over 500 paintings mostly from the Renaissance. From the Room of the Niches through Venus, Apollo, Mars, Jupiter and Saturn ending in the Room of the Iliad, Alessandro Michele’s new collection was presented surrounded by paintings by Titian, Raphael, Perugino and more. The rainbow striped chairs for the guests in the rooms are printed with “A Song to Bacchus”, a poem by Lorenzo de’ Medici, considered the patriarch of the Renaissance. Beauty. Creativity. Energy. All words applicable to Gucci’s cruise wear collection. Colours of pink and violet flowed on gowns down the runway, with bejeweled gold bows in the models hair; the flowing gowns fit for a princess. Intense graphics were seemingly tattooed up and down the collection; flowers, snakes, tigers, butterflies, dragons and bees. And don’t forget the pearls, here, there and everywhere. This was an absolute star filled spectacle, which has contributed to the hype of the event. Elton John, Kirsten Dunst, Jared Leto, Satires Ronan, Valeria Golino, Silvia Venturini Fendi, and Delfina Delettrez Fendi were in attendance – just to name a few.